Preserving is an ancient way to make summer and autumn fruits and vegetables last into the winter. Guy Tullberg's family has been preserving for generations in the Wiltshire countryside, and their award-winning pickles, jellies, sauces and relishes are among the best in the world. He reveals the tips and techniques for successful preserving that have been handed down from generation to generation. A tracklement - a savoury jelly or sauce - should never be dominating, always an adjunct to a meal or a dish and to take just two examples, life is always a little less colourful without a perfectly balanced pickle on a piece of pork pie or the pleasurable chomp of chutney in a sandwich filled with your favourite cheese or meat. The diversity of preserves and whether they are sweet or sharp, hot or fruity, smooth or chunky, is matched only by the variety of things with which they can be eaten. These tracklements are so versatile, so adaptable, there is a barely a meal or dish that couldn't benefit from adding them. The book includes 100 recipes, covering pickles, chutneys, mustards, relishes, sauces, ketchups, marinades, dressings, jellies, cheeses and fruit butters; and range from traditional preserves such as Chilli Jam, Farmhouse Pickle and Rosemary Jelly and preserves to more modern, fresher flavours such as Sweetcorn Relish, Gooseberry and Elderflower Jelly and Tarragon Mustard. Simple instructions are given for the preserving processes and any equipment needed. 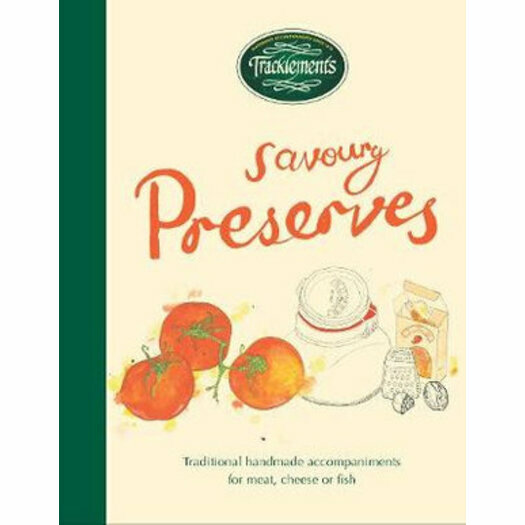 Tracklements is the UK's leading preserves company, selling 2.5 million preserves every year through Waitrose, Ocado, Booths, Selfridges, Whole Foods, Fresh & Wild and Neal's Yard Dairy, among others. They are also sold internationally - in Australia, Canada, Denmark, Dubai, Germany, Greece, Hungary, India, Ireland, Italy, Japan, Norway, Portugal, Spain and the USA. Tracklements has won over 100 awards, and was a recent finalist in Radio 4's Food & Farming Awards. At the forefront of the company is author and MD Guy Tullberg, who is among the UK's leading experts on preserves.